As any social platform expands and reaches the online equivalent of middle age, there are often criticisms of what that growth requires and cries of “it was better when,” and Twitter (s twtr) is no exception to that rule. One of the most prominent complaints about the service — one that I have made myself in the past — is that as more and more people have joined the network, the signal-to-noise ratio has plummeted, and the stream has become increasingly filled with meaningless chatter about inanities like Justin Bieber’s latest PR stunt. A recent piece in the New York Times, entitled “Valley of the Blahs: How Justin Bieber’s Troubles Exposed Twitter’s Achilles’ Heel,” is a good example of this genre. In it, writer Jenna Wortham (@jennydeluxe on Twitter) argues that the volume of users has changed the nature of Twitter, transforming it from a kind of real-time news feed into a noisy crowd of attention-seekers, all of whom want to be the first to opine on whatever the current topic of discussion is. Is the noise overwhelming the signal? I must admit that I felt a rush of sympathy for much of what Wortham was saying as I read her piece. As I tried to point out in a recent post of my own, I often feel somewhat overwhelmed by my Twitter stream, and I wish the service made it easier to filter content, rather than just giving you one undifferentiated river. A never-ending flow of real-time commentary can be a wonderful thing, but also a terrible one, depending on what you happen to be looking for. At the same time, however, Wortham’s piece was criticized by Twitter fans in the same way mine was, and that criticism has some merit: many argued that her view of the service is distorted by the fact that she follows more than 4,000 people (as I do) — and also that since she is a member of the media, she is likely following some of the noisiest and/or most irritating of the Twitter “social media guru” crowd. Their solution? Follow fewer people, and/or less irritating people. 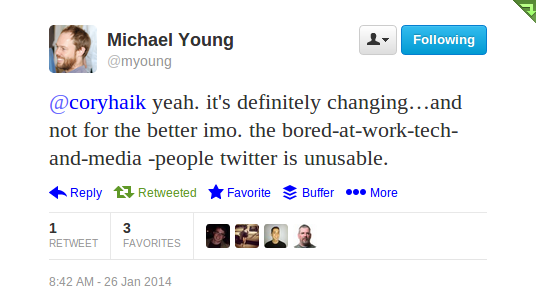 Even though I complained in my post about Twitter’s lack of tools, there is a lot of truth to this argument. In a way, there is no single, dominant view of Twitter and how it works (or doesn’t work) — instead, there are thousands, if not millions, of different lenses through which we can view Twitter. Some are terrible, as Charlie Warzel tried to demonstrate by giving us a view inside Justin Bieber’s timeline, and others are not. In a sense, it is up to each of us to tune the service to our liking. For me at least, and I think for some others, the hardest part about streamlining or improving my Twitter experience is that I use it for different things at different times. Sometimes it’s about work, and following what people are saying about a topic — and in many cases, I actually like the multitude of responses, even the stupid or funny ones, because they amuse me. At other times, however, I am trying to follow something I think is important, and it becomes very difficult. 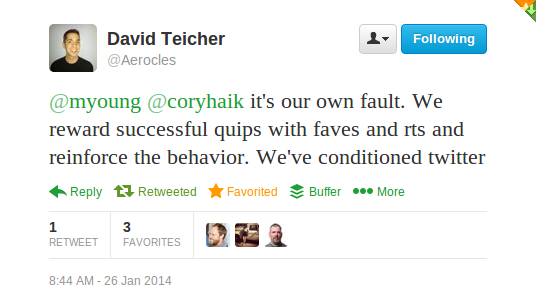 Is this phenomenon the “Achilles heel” of Twitter, as Wortham argues? Yes and no. Much of what she is complaining about likely does have to do with following too many people, or following the wrong ones — but I also believe that this does pose a long-term risk: to the extent that people become frustrated by the noise, they are more likely to depart for quieter environments such as SnapChat or Whisper or even Tumblr. And that is something Twitter should be concerned about. There are hashtags, search, lists or even tools like Hootsuite if you need more options to filter. 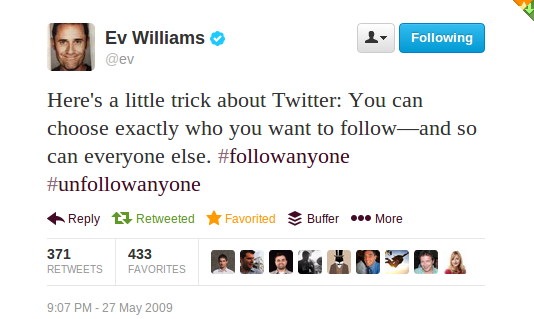 As Ev said, you can follow and unfollow how you like, when you like. Twitter is reflective of real life, where there is noise you need to filter out too. I hate to burst the bubble of social media enthusiasts everywhere, but don’t kid yourself, Twitter has always been like this. Twitter follows a ‘waterfall’ model – and advocates just this as the primary consumption form. As a company, they are trying to balance between helping the power users, and the naive users. 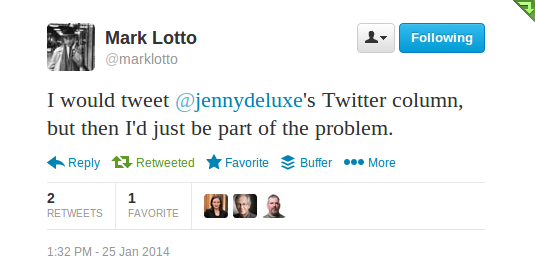 A complex ranking mechanism will make their new users not “get” what Twitter is. The older users are drowning in the waterfall. The problem with the waterfall is that you dont know what you get when you dip into it, and you dont know what you’ve missed when you are not dipping. Twitter has been trying to engage its users through alternate forms of consumption – the Discover Tab, for instance. There’s a lot of sophistication there – and many friends who’ve felt their streams have become noisy keep the Discover tab as the main tab. With all this, there’s just too much signal flowing through Twitter for us to ignore it. Their open API system has allowed other startups explore and promote alternative ways to dip into their streams. A plug for ourselves, at Pugmarks (pugmarks.me), we believe in contextual content discovery. Think of a smart companion that unearths exactly what went through your Twitter, that’s relevant to you now. After using Pugmarks, many users do not feel the need to keep their Twitter streams “trim”. When you are doing something, the good stuff from Twitter is always accessible. Great post! But there’s no mention of Twitter lists or following hashtags rather than Tweeters. That’s how I filter out the noise (with Tweetdeck).